You know how sometimes you read a book, just because, without giving a thought to its genre? Well, Kon-tiki expedition was just that kind of book for me. I read it in sixth grade, I found it a little bit boring to read all of the details, skipping here and there a bit, but overall a very interesting book. It was in relation to the Kon-tiki expedition that I first heard about the Easter Islands. This is the “youngest” mystery in my series so far. You can see the scale of the statues which are known as Moai here. Cliff Wassmann has provided amazing pictures and brilliant write-up of Easter Islands, thanks Cliff for letting me link to your site. I checked out the Google map of Easter Island and was a bit startled to see the satellite images of modern houses – you don’t normally think of the modern and the ancient structures intermingled. But I was a confused as to why it is still a mystery. The native people are the descendants of the folks who actually put up all these statues. I don’t understand why they did not pass down that knowledge to the subsequent generations. Till today I thought the only mystery on Easter Island was the Moais. As it stands now, here’s an incomplete list of tidbits on Easter Island. 1. How did the original inhabitants manage to reach this island, which is one of the most isolated inhabited territory on Earth? 2. Easter Island is one of the youngest inhabited territories on Earth – but still managed to have “ancient mysteries”. 3. It is called Easter Island because it was “re-discovered” in 1722 on Easter Sunday – ironic that this post is almost on Easter Sunday 2012. 4. Prior to the European invasion, there was a clear cut class system including a king. But sadly the last king, along with his family, died as a slave in the 1860s in the Peruvian mines. I think that might partially explain why a lot of the knowledge also was lost. 5. The islanders did have a written language, the Rongorongo script which was inscribed on wooden tablets. Only around twenty-one of those tablets survived and only two and a half lines from one tablet has been translated so far. I would love to visit Easter Island someday, wouldn’t you? Keep up the good work. The interesting history you are blogging about are fun to read. I have travelled a little in my time and I have been on the Road to Damascus. I am sure it is different now than when Paul was there, but none the less, I enjoy history. 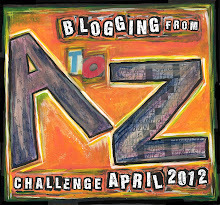 Thanks for stopping by my A to Z blog. I also would love to visits the sites I am writing about – glad you got to do it! Very interesting! Greetings from a fellow A to Z’er. Good luck with your writing. Your great uncle would appreciate it. Thanks for the kind words, Heather! I loved your post on Female Authors, my all time favorite author is Enid Blyton. Good luck to you too on the AtoZ Challenge.